Dry eye syndrome is a very common eye disease that is characterized by loss of a normal tear film on the surface of the eye. This results in symptoms such as a foreign body sensation, itchy, scratchy, burning sensation, sticky, pain, redness, and watering from irritation. Slit examination by an eye doctor may show a decreased tear film on the surface of the eye and staining of abnormal cells on the eye. 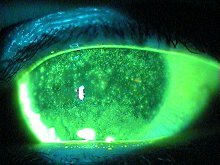 Until recently there was not an objective test for the diagnosis of dry eyes. A company named TearLab Corporation has developed the first objective test for dry eyes that has received FDA approval. As a person begins to develop dry eyes, the different layers of the normal tear film become compromised leading to evaporation of the liquid portion of the tears. This leads to an increase in concentration of the elements of the tear film. As this occurs the salt level in the tear film increases causing an increased osmolarity of the tears. The increased salinity of the tear film results in irritation and inflammation of the cells on the surface of the eye which causes the symptoms related to the dry eye syndrome. The TearLab testing program provides objective data for help in diagnosing and treating dry eye patients. A tear osmolarity of 308mOsms/L and higher is an indication of dry eyes. The TearLab equipment uses a temperature-corrected impedance measurement to produce an indirect evaluation of tear osmolarity. It uses only 50 nanoliters of the tear film to run the test. The TearLab osmolarity pen is used to collect the fluid from the eye. It holds a test card and the pen produces a mechanical-electrical interface to transmit the data to the TearLab reader. The reader is a portable unit that converts the tear sample into an osmolarity measurement that is recorded. There is now an objective test that allows an eye doctor to make the diagnosis of dry eyes earlier in the disease process. Treatment can be started earlier and it should help in the morbidity related to the long term effects of dry eyes. Tear osmolarity will also provide an object basis about the results of the treatment of dry eyes. I HAVE LUPUS WHICH IS A PART OF DRY EYES. I ALSO HAVE BLEPHAROSPASM… HOW MUCH IS TRANQUIL EYES ? IS IT RECOMMENDED FOR PEOPLE WITH DRY EYES?